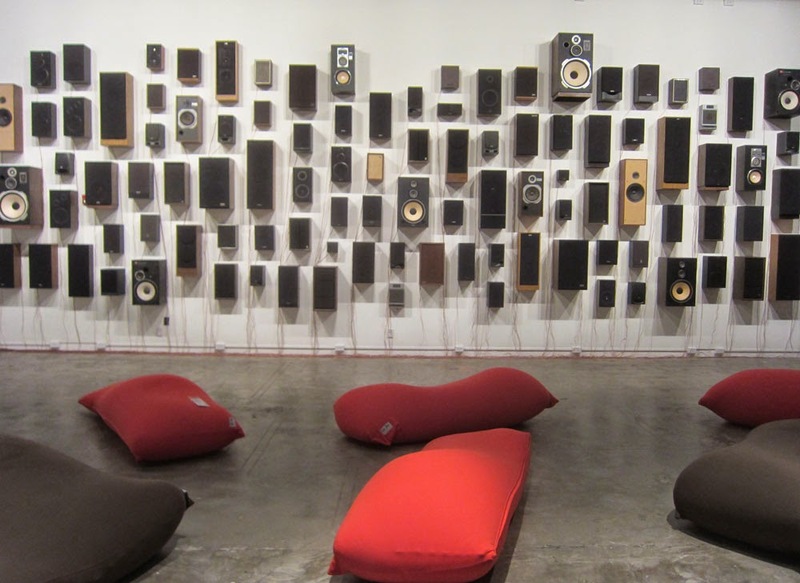 Fermata, at Artisphere through August 10, is a pioneering, avant-garde exhibit of sound art. All the hip, weird, and creative people in the Greater Rosslyn Metropolitan Area will be at a free reception for Fermata this Thursday, 7-9pm. But suppose you're just a normal, boring person. Does this exhibit have anything to offer you? Fermata features amazingly comfortable beanbags. The beanbags are Yogibo yogis. When you lounge in these beanbags, you'll feel completely relaxed. Everyone should give them a try! When you're relaxing in these beanbags, you might just hear something interesting. The Tribune's journalist heard what sounded like a cosmic battle between Rosslyn and an evil empire seeking to take away all bikes and make everyone drive cars. Laser guns and bullets played across the wall of speakers. In the end the sounds of battle faded, and Rosslyn remained the largest pitstop for Bike to Work Day, upcoming this May 16. After that came a guy talking about putting on an art exhibit in a church. It was just a normal, workplace conversational such as regularly occurs between editors and journalist discussing arrangements for coverage of a story. But it sounded rhythmic and symphonic with the "ch" in "church" bouncing across the speaker wall.